Meet asteroid 1999 RQ36, a chunk of rock and dust about 1,900 feet in diameter that could tell us how the solar system was born, and perhaps, shed light on how life began. It also might hit us someday. "This asteroid is a time capsule from before the birth of our solar system," said Bill Cutlip of NASA's Goddard Space Flight Center in Greenbelt, Md., one of the leaders of Goddard's effort to propose a mission called OSIRIS-REx that will return a sample from RQ36. "You can't underestimate the value of a pristine sample," Cutlip added. Meteorites, pieces of asteroids that break away and plunge to Earth, are "toasted on their way through Earth's atmosphere," Cutlip explained. "Once they land, they then soak up the microbes and chemicals from the environment around them." "With a pristine sample — especially one from an asteroid type not available in NASA's meteorite collections — scientists will learn more about the time before the birth of our solar system, the initial stages of planet formation, and the source of organic compounds available for the origin of life," said Dr. Joseph Nuth of NASA Goddard, OSIRIS-REx Project Scientist. Asteroids are leftovers from the cloud of gas and dust – the solar nebula -- that collapsed to form our sun and the planets about 4.5 billion years ago. As such, they contain the original material from the solar nebula, which can tell us about the conditions of our solar system's birth. In some asteroids, this material got altered by heat and chemical reactions, either because they collided with other asteroids, or because they grew so large that their interiors became molten. That's what makes RQ36 special. It's small and appears to have been altered very little, preserving the snapshot of our solar system's infancy. It's also rich in carbon, an element used in many of the organic molecules necessary for life. Organic molecules have been found in meteorite and comet samples, indicating that some of life's ingredients can be created in space. Scientists want to see if they are also present in RQ36. Sample return, however, isn't the only objective for the mission. This asteroid crosses Earth orbit, and the International Astronomical Union's Minor Planet Center has officially classified RQ36 as a "potentially hazardous asteroid," with a slight chance – one in 1,800 – of an impact in the year 2170. "We'll orbit RQ36 for about a year to analyze its surface and select a sample site. 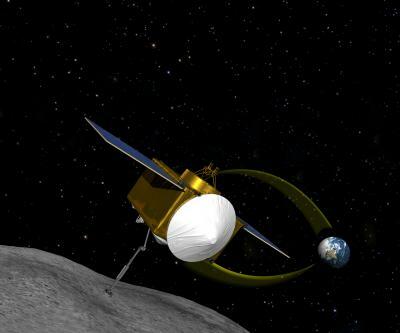 This will give us experience with operating spacecraft in the vicinity of an asteroid, experience that will be useful if we ever have to send a mission to deflect one," said Nuth. Piloting a spaceship near an asteroid is not easy. Most are lumpy and rotate more rapidly than planets, which makes for challenging landings. These small objects have feeble gravity, so other forces can significantly influence the spacecraft's position. "Gravity on this asteroid is so weak, if you were on the surface, held your arm out straight and dropped a rock, it would take about half an hour for it to hit the ground. Pressure from the sun's radiation and the solar wind on the spacecraft and the solar panels is about 20 percent of the gravitational attraction from RQ36. It will be more like docking than landing," adds Nuth. If approved, the mission will be significantly more capable than the original OSIRIS proposal. "OSIRIS was a basic sample return mission," says Nuth. "OSIRIS-REx adds more instruments to give us a complete map of the surface composition and 3-D shape, or topography, of the asteroid. It will allow us to put our sample in the proper geologic context, so we'll have a much better idea of what we're really sampling," says Nuth. The mission will also feature a more precise and accurate LIDAR (Light Detection And Ranging) instrument. This instrument will bounce laser pulses off the surface of the asteroid to measure its topography. The OSIRIS Laser Altimeter will be provided by MacDonald, Dettwiler and Associates Ltd., Richmond, British Columbia, Canada, and funded by the Canadian Space Agency. "Like the Moon rocks from the Apollo missions, samples of RQ36 will keep on giving. They'll be analyzed for decades after mission is complete, using new techniques we can't even imagine now, to test new theories of how we came to be," said Nuth.